Phoenix-based radio producer Ben Moran travels to Tanzania to visit his sister, who delivers health care by plane to the Maasai people. For years, Ben has heard of his sister's remarkable experiences in East Africa. 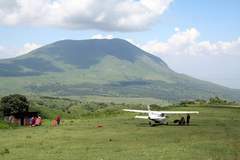 As a pilot for Flying Medical Service, she deliveres health outreach clinics and performes emergency evacuations in the remote lands of the Maasai people. He decides to visit her to see for himself life she lives and the work she performes among a unique and disappearing culture in Northern Tanzania.